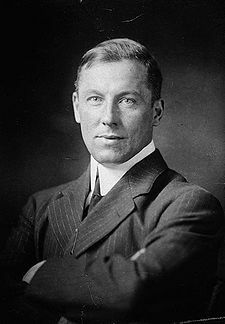 Robert Service (1874 - 1958) was a Scottish poet who became smitten with the Yukon Territory when he moved to Canada at the age of 21. Though he longed to be a trail-blazing cowboy, and many thought he indeed lived the life of which he wrote, Robert was, in fact, a bank clerk. After wandering North America for several years, working at odd jobs and various bank branches, he finally settled down in Dawson City, Yukon, some time after the Gold Rush. Robert began writing poems about his stark and beautiful surroundings, and about the legends and lifestyle associated with that part of the world. When his collection of poetry, The Spell of the Yukon and Other Verses, was published in 1907, it was an immediate success, made Robert wealthy beyond his greatest expectations, and earned him the nickname "The Bard of the Yukon." Robert alternated living in North America and Europe for the remainder of his life--even spending a few years in Hollywood; the cabin in the Klondike where he made his home is now a Canadian national park site. Robert Service is one of my favorites, and a visit to Dawson City some years ago yielded a Service interpreter who was delightful. This is a very optimistic poem I think, and the rhyme scheme is worthy of salute. Thanks for the background information on Service, Jayne. "Frost-gemmed window pane" applies to my windows this morning. Ah...Robert Service returns to YDP with this charming offering. With the eighteenth century conflating of courage and war, what a welcome poem. The intricate rhyme scheme is worth close study. And so he did! I enjoyed this poetic affirmation of of the out-of-season apple blossom. I especially like Stanza 4. This one's much sweeter than most of the Robert Service poems I've read. He had a delightful sense of humor that some would call macabre. The last four lines of this poem could well apply to most of the men he chose as subjects.